The Chartist movement shows the enormous struggle it's taken to secure democratic rights — and how far we have yet to go. In 1839, the common people of the United Kingdom, fed up with oppression and poverty, took to the streets by the tens of thousands and united under the banner of a new social movement: Chartism. Their goal was rather simple. They wanted the right to vote. Seven years earlier, a coalition of middle- and working-class radicals had forced the Reform Act through parliament, extending suffrage from the landed aristocracy to middle-class property owners but excluding the vast majority of Britons, who were property-less workers. At first, many working-class radicals thought their newly empowered middle-class allies — organized in the Whig Party — would pursue a radical democratic reform agenda. They hoped their common enemy — the conservative, landed aristocracy — would be enough to unite them behind a program of expanding suffrage to the property-less and serving the interests of the bourgeois and proletarians. But these hopes were soon dashed. The Whigs joined with the elite to safeguard the Act of Union — the legislation creating a single United Kingdom of Great Britain and Ireland, ruled centrally in London — against Irish protesters, who followed in the footsteps of the abortive Irish republican revolution of 1798. When the new Reformed Parliament opened, a wave of civil disobedience and popular resistance against mandatory church tithes swept across Ireland, terrifying property owners who feared another republican revolt. Instead of supporting the Irish protesters, the Whigs endorsed the draconian Coercion Bill, which empowered the Lord Lieutenant of the Royal Irish Constabulary to “suppress any meeting deemed by him to be dangerous to public safety,” declare martial law, enforce a curfew, and suspend habeus corpus. Working-class radicals across Great Britain felt betrayed. The Whigs had shown themselves all too willing to abandon the principles of freedom and equality when their property was at stake. British workers vigorously opposed tyranny in Ireland, not only because of the injustice and suffering it imposed on the Irish, but also because it strengthened their mutual oppressors — the property owners and the British state. They presciently argued that the techniques of military occupation the authorities developed on the Emerald Isle could easily be imported back and deployed against popular agitation in the industrial districts of England, Scotland, and Wales. The Whig’s Irish policy was not the only affront to working-class radicals. The Reformed Parliament’s 1833 Factory Act was an insult to the organizers of the movement to limit working hours. It did little more than ban child labor below the ripe old age of nine (and even then, only in certain industries), while limiting the working day for nine- to twelve-year-olds to eight hours and thirteen to seventeen-year-olds to twelve. It established no cap on work hours for adults. The Factory Act was coupled with a vigorous assault on labor unions across the country, for which Tories and Whigs more often than not joined forces. To make matters worse, in 1834 the parliament passed the New Poor Law, which reduced alms to the destitute, introduced dehumanizing work requirements, and established intrusive oversight measures for the poor. For working-class radicals, these developments signaled that their political alliance with the middle-class Whigs had come to an end. “Whigs and Tories are united, we see it very plain, To crush the poor labourer, it is their daily aim,” went a poem in one Newcastle pamphlet. The British working class had learned what many others across the world have come to learn since: to achieve political democracy and defend their interests, they would have to organize as a class and take the fight for emancipation into their own hands. In 1839, constituencies across Great Britain elected a radical “anti-parliament” on the basis of universal male suffrage. Their purpose? Draft and present a petition, called the People’s Charter, to the country’s legislative body. The Chartists had no illusions about the petition’s chances of acceptance — the debate revolved primarily around what to do after its rejection. The convention was split between primarily middle-class delegates who favored using “moral force” — persuading the enfranchised classes to accede to their demands through reasoned argumentation and appeals to shared principles — and the more working-class delegates partial to “physical force” — employing disruptive tactics, or the threat thereof, to force working-class demands on the ruling classes.As the convention went on, nearly all the advocates of “moral force” resigned and went home. The “physical force” wing was led by Feargus O’Connor, a militant, Irish-born organizer and owner of the Chartists’ favored weekly newspaper, the Northern Star. After the exodus of most of the “moral force” Chartists, the convention released a manifesto presenting a list of the “ulterior measures” to be pursued, urging the millions to employ “all and every means in their power” to achieve the implementation of the People’s Charter. Most notably, the convention instructed the masses to prepare for a “sacred month,” or “grand national holiday,” in which all labor would be withheld for a month until the demands of the charter were granted. It was one of the first calls for a general strike in modern history. Well aware of the repression such an action would provoke, the convention urged workers to take up “the arms of freemen” to defend their right to strike. As expected, parliament overwhelmingly rejected the petition. The landed aristocrats and bourgeois radicals of the two ruling parties balked at both the Chartists’ ends and means. When scattered riots broke out around the country, the authorities used it as an excuse to break up the convention and establish police forces in the industrial districts that comprised the charter’s base of support — a technique of social control developed, among elsewhere, in Ireland. n the face of state repression, the leaders reduced the duration of the planned month-long general strike to a mere three days. Though largely symbolic when carried out, the action still resulted in the arresting and jailing of the strike leaders. Small armed uprisings, organized in secret, erupted in the industrial districts that winter. The most significant of these occurred in November 1839 in Newport South Wales, where thousands of armed Welsh workingmen, organized by Chartist leaders John Frost,Zepheniah Williams, and William Jones, descended on a military post in the center of town. Twenty-two Chartists were shot dead before the crowd dispersed, and the three organizers tried for high treason were booted out of the country. Undeterred, the Chartist movement continued to organize and expand their activity. In the early 1840s, the middle classes focused on fightingto repeal the Corn Law, a protectionist measure that taxed imported grains. While landlords benefitted greatly from the tariffs, manufacturers opposed it because it raised the cost of bread and, by extension, the wages they had to pay workers. Anti–Corn Law activists expected the easy support of the working masses and made public appeals to galvanize their cause. It was a battle of the employer and the employed. Masters were astonished at what they deemed the audacity of their workmen, who made no scruple standing beside them on the platform, and contesting with them face to face their most cherished doctrines. Terrible was the persecution they suffered for taking this liberty. Loss of employment usually followed, but it was in vain that their employers endeavored to starve them into submission . . .
Up and down the country, hordes of Chartists swarmed the Anti-Corn Law League’s meetings. In 1842, the radicals again delivered to parliament a petition for the People’s Charter, this time with over three million signatures. I believe that Universal Suffrage would be fatal to all purposes for which government exists, and for which aristocracies and all other things exist, and that it is utterly incompatible with the very existence of civilization. I conceive that civilization rests on the security of property . . . I will assert, that while property is insecure, it is not in the power of the finest soil, or of the moral or intellectual constitution of any country, to prevent the country sinking into barbarism . . .
Macaulay had every right to be concerned. This time around, the charter was being taken up by an increasingly militant trade union movement. [U]ntil the working classes of this country have the management of their affairs vested in their own hands, according to the principles laid down in the People’s Charter, they will never be able successfully to struggle with those who oppress, injure, and deprive them of their employment. Thus, when they launched an enormous wave of strikes that threatened to render inoperative the British Isles’ economy, strikers advanced not simply the “economic” demands of higher wages and shorter hours in their particular workplaces, but the “<political” demands of the People’s Charter. To the Colliers of England and Wales. Strike! Colliers! Strike for the Charter! In your hands is reposed such a power as the tyrant few, who oppress and grind the faces of the poor, cannot withstand. Without coal the lordly aristocrat cannot cook his luxurious meal. Without coal the Steam Engine whose iron arm has beggared so many of your poor fellow-countrymen, willing to work — murdered thousands of innocent children in our Cotton Mills yearly — reduced thousands of tender mothers to a worse state than brute beasts, and hung their pale limbs with filthy rags—without coal this giant monster, the Steam Engine, cannot work. Your labour, my honest friends, supplies it with strength, for without Coal it is powerless. Stop getting Coal, for Coal supports the money-mongering Capitalists. Riots subsequently erupted in several cities, and workers brought entire industries to a standstill in one of the first general strikes in history. 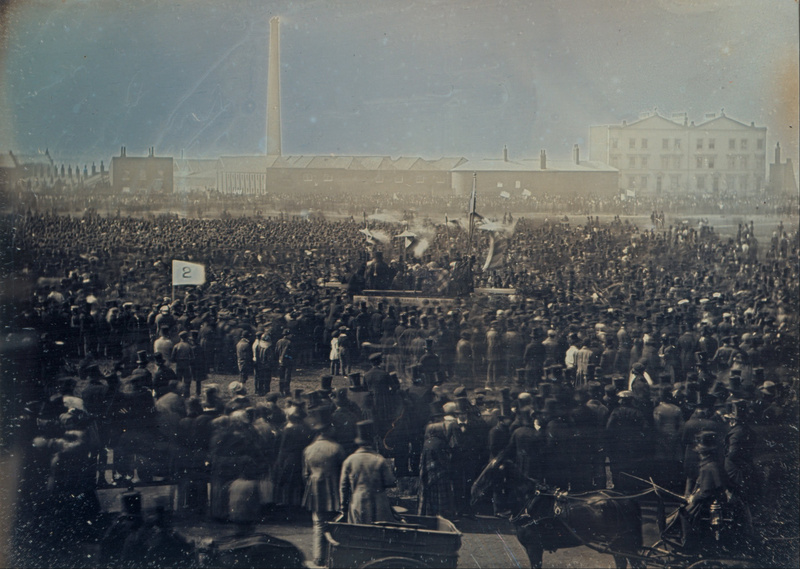 Authorities responded by arresting and sentencing — dozens of Chartist leaders were tried in London, and over a thousand strikers in the industrial districts. But what ultimately defeated the strike was hunger. In the wake of 1842, the movement began showing signs of fraying. The overriding focus on the political demands of the People’s Charter had united people otherwise separated by workplace, industry, craft, and region. But following the strike’s defeat, the strategy of mass politics seemed to have exhausted itself. Workers increasingly turned toward localized efforts to advance their interests — schools, temperance leagues, unions, socialist cooperatives, and the like. The largest and most significant of these projects was Feargus O’Connor’s Land Plan. Influenced by the agrarian radicalism of Thomas Paine and the United Irishmen, O’Connor founded a friendly society that enabled industrial workers to escape their dependence on wage labor by purchasing small plots of agricultural land. Workers would buy into the scheme; the funds raised would be used to obtain large estates, which would be subdivided; and then participants would be chosen by lottery for settlement. O’Connor’s Land Plan was ultimately unsuccessful. Not only did lifelong industrial workers make poor small farmers, but legal issues beset the project and eventually did it in. During its lifetime, however, the plan was extremely popular among industrial workers eager to free themselves of the insults and hardships of wage slavery, and it helped keep the Chartist movement united and hopeful in the face of the ’42 defeat. In these years, Chartism also became inflected with internationalist and communist elements. Prominent leaders likeGeorge Julian Harney and Ernest Jones became close collaborators with Marx and Engels and participated in groups of continental revolutionaries exiled in London, such as the Fraternal Democrats and the Communist League. Harney took over as editor of the Northern Star in 1845, and began placing a greater emphasis on radical activity in other countries. The newfound orientation toward Europe would prove to be a source of renewed strength on the home front. In 1848, the working classes of Great Britain made a final push for the People’s Charter. The intervening years had shifted a number of factors in their favor. Daniel O’Connell — the radical-turned-conservative leader of the Irish repeal movement who had denounced trade unionism and impeded cooperation between English Chartists and proponents of Irish self-rule — had died the previous year. And while the Young Irelanders kept Chartism at arm’s length, the radical republicans surrounding John Mitchel sought to link Repeal in Ireland and the People’s Charter in Britain. But the British government marshaled an unprecedented military and police force to lock down the capital ahead of the third petition’s presentation, and the Chartist leadership felt compelled to avoid a violent confrontation that was sure to end in disaster. The shift toward self-help organizations had taken its toll as well. Many now wished to stay off the dangerous streets and tend to their cooperatives’ books. The revolutionary agitation that did occur paled in comparison to 1839 or 1942. The armed revolt in Ireland that summer — occurring among a population enfeebled and driven into despair by years of — amounted to little more than a skirmish. Over the course of 1848, the leaders organizing in the provinces were arrested, the Land Company effectively collapsed, and the Chartist movement came to an end as a mass force in British politics. They had failed in their quest to extend the franchise. What should we make of this momentous but unsuccessful movement? Was it the last gasp of the failed eighteenth-century political revolution in Great Britain? Was it nothing more than the political expression of a class of people on the verge of starvation? Was it the first attempt at “proletarian revolution”? The work of late historian and political activist Dorothy Thompson — the twentieth century’s foremost authority on Chartism and the wife and collaborator of British historian E. P. Thompson — offers the richest history of the movement. Her new collection of essays — The Dignity of Chartism, edited by Stephen Roberts — is devoted to sifting through the historical analyses of the movement, good and bad. Against those who view democratic politics as originating among a “radical bourgeoisie” and trickling down to the common people, Thompson casts the Chartist movement as one thoroughly of and for the working class. s Thompson argues, Chartism emerged out of a tradition of lower-class radicalism with roots in the French Revolutionary period, and many of its leaders had cut their teeth on the working-class struggles of the early nineteenth century: the fight for the ten-hour workday, the movement to repeal the barbaric and humiliating Poor Laws, and the effort to build an organized trade union movement. He knew that the working men were pressed down by the capitalists . . . he divided society into just two classes—the rich oppressors and the poor oppressed. The whole question resolved itself into the battle between labour and capital. The modern form of class conflict was the driving force behind Chartism, both on the pages of the journals and on the barricades in the streets. This gave the universal suffrage demand a distinctly working-class content. Thompson also challenges the common caricatures of O’Connor. Many prior accounts depict O’Connor, the Irish-born Chartist rabble-rouser, as a drunken, belligerent, irrational demagogue who did the movement far more harm than good, whipping up the industrial North into a bloodthirsty frenzy and ignoring the sage leadership of more moderate Chartist figures in London. Thompson also takes pains to highlight the important role working-class women played in the Chartist movement. While women’s suffrage was far from the popular consciousness at the time, those women who engaged in politics did so almost exclusively through Chartism. Chartist women didn’t advance a distinctly feminist agenda. Battling brutal conditions and never-ending shifts in the factories, the humiliations of the New Poor Law, and the constant threat of starvation, they largely viewed their oppression in class terms and embraced universal manhood suffrage and the additional goals of the male Chartists as their own. But Thompson describes them as among the movement’s most stirring writers and orators, most insightful political thinkers, and most militant protesters during street confrontations with the police. Thompson’s final corrective concerns the political nature of Chartism. Contrary to those who see Chartism as little more than a popular outburst against the poverty of the early Industrial Revolution, Thompson argues the movement was political to its core. For British working people, the political arena had not lost the enchantment or promise it seemed to hold in the days of the French Revolution. The mass enthusiasm around the People’s Charter demonstrates as much. They had faith that popular sovereignty — and the sorts of emancipatory policies they could enact upon attaining it — was the solution to their degradation and poverty. To examine the Chartists is to remember the enormous strife and sacrifice it took to win even the rudiments of political democracy. The enfranchisement of working people was not, as is sometimes imagined, a ruling-class ruse to co-opt and deceive the masses. Quite the opposite: the bourgeoisie and other propertied classes resisted — vehemently and often quite violently — working-class struggles for universal suffrage. Today, universal suffrage remains elusive even in many self-proclaimed democratic countries. The United States is a particularly glaring example: tens of millions of workers are denied the vote or otherwise disenfranchised because of immigration status, criminal history, or lack of official identification. A renewed Chartist movement would, for starters, demand the extension of the franchise to all those who lack it. But it would also embrace one of Chartism’s seminal contributions to the history of working-class movements: the necessity of political struggle for popular emancipation. In the 1850s, after a decade of ramped-up repression, many of the Chartists retreated from the realm of politics and turned toward apolitical self-help organizations. Increasingly influential “utopian” socialists urged radicals to withdraw from political affairs and establish cooperatives, mutual aid societies, and other institutions outside the state. The past few decades have been marred by similar depoliticization. Socialist parties and labor movements have been in retreat, and lifestyle politics on the ascent. Yet since the Great Recession, there’s been an efflorescence of movements fighting for expanded democracy and self-determination. They are, in many ways, the Chartists’ heirs. Socialists should be wading waist deep into these movements, agitating, educating, and organizing. We should take up the fight to defeat elite-driven policies and assert popular sovereignty on the basis of truly universal suffrage. Nearly two centuries after the drafting of the People’s Charter, the working-class struggle for democratic self-government remains as urgent as ever.